NPR pretentiously tries to mock the 2nd Amendment folks, and makes fools of themselves (on our tax dollar). Stephen Harrigan (and thus NPR's) basic point is that the flag originates with the Battle of Gonzales "was the flashpoint of the Texas revolution," and they don't like the appropriation of the flag with the canon for other things. As the story goes, the Mexican army had loaned the tiny settlement of Gonzales a small brass cannon to defend itself from hostile Apaches. But the American colonists in Gonzales, who came to be known as Texians, had grown restive. So the Mexican commander in nearby San Antonio sent soldiers to take back the cannon. The men of Gonzales fired the little cannon at the Mexican troops. And they raised a flag sewn from a woman's wedding dress that showed a lone star, an image of the cannon, and the words "Come and Take It." Then NPR goes on to whine about the appropriation of the one true meaning (above), and whines about it being used by washing places, and most of all, the 2nd Amendment proponents that use it with an AR-15 (that's quite popular). Ironically, the image they show in the article is one with an AK-47, so they didn't even reference the right gun/silhouette. That would be great and all... well, actually, it would still be stupid political correctness of snowflakes, "waaa! Stop appropriating our flag". But at least it would be accurate whining. If that was the actual full story. 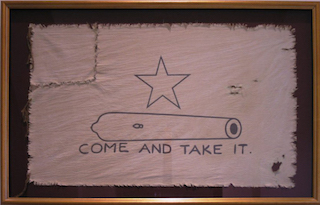 But the slogan "come and take it" and Molon Labe (Greek) far predate the Gonzales flag -- which NPR and Harrigan completely fail to point out. And the reason it was used in Gonzales, was in reference (and cultural appropriation) of the original Greek (Sparta) version. So any complaints by the Gonzales folks complaining about others using more modern arms, is immediately voided by them using a canon in place of spears and shields. Or of course, the meaning of "take our arms" is consistent, no matter the arms that are referenced on the flag. In the gun circles, I see "molon labe" with a greek helmet is nearly as popular in that crowd as the "come and take it" + cannon derivation, implying that they all know more about what's going on than a sanctimonious NPR reporter and his historian does. But what else is new? If you doubt it, search in google images for "molon labe" and see what comes up-- that would have taken the NPR guy at least 15 seconds of research to get that, if they had journalists and fact checkers on staff. Which begs the question of why if 5% of NPR funding comes from federal, state, and local taxes, should I have to subsidize anti-2nd Amendment drivel (and NPR)? Don't get me wrong, I like NPR, and listen to it (more than I watch FoxNews). But the government shouldn't be in the propaganda business. And NPR is not middle of the road. As for the real origin, it wasn't the Texas Gonzales Flag, it goes back to King Leonidas I of Sparta. 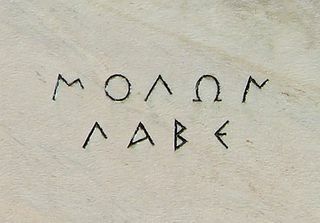 At the Battle of Thermopylae in 480 BC (during the second Persian invasion of Greece), Leonidas replied to Xerxes’s demand that the Greeks surrender their arms with, “molon labe”— come and take them. I don't mind the Texas talk, it just would have been nice if they even mentioned the true meaning.